Learn chocolate chip cookie science so you can create your perfect cookie! Love a really chewy cookie? Or a really crispy cookie? OR how about cakey? These guidelines will help you edit your cookie recipes to create your own perfect chocolate chip cookie! There is no doubt in my mind that Chocolate Chip Cookies are the ultimate classic baked good and comfort food. There is just nothing that compares to a warm gooey cookie right out of the oven. And in my early baking years I set out on a mission to develop the most perfect chocolate chip cookie recipe ever. But this led to the question: What is my idea of the perfect chocolate chip cookie? I am all about contrasts, so I want a variety of textures and flavors. So I worked hard to create that for myself. A thick, chewy on the inside crunchy on the outside cookie that has hints of caramel and salt with dark chocolate chips and toasted pecans. You can find my Ultimate Chocolate Chip Cookie Recipe here. But this process of creating my own perfect chocolate chip cookie showed me that not everyone has the same idea of what makes a chocolate chip cookie truly perfect. You might like yours super thin and chewy. Or maybe really thick and cakey. So I am here to teach you the chocolate chip cookie science so that you might create your own perfect cookie. Let’s start at the beginning with the Nestle Toll House Cookie Recipe. You know, the one on the back of the bag of chocolate chips? It’s the standard, classic Chocolate Chip Cookie Recipe. It creates a fairly middle road cookie. Chewy in the middle, slightly crispy on the edges, with a fairly one note flavor profile. These are the nostalgic cookies from my childhood. You know the drill: Combine dry ingredients. Cream butter and sugar. Add the other wet ingredients. Add the dry ingredients to the wet and the chips. Bake in a 375 degree oven for 9-11 minutes. I see the Toll House recipe as a fairly neutral chocolate chip cookie recipe and a good starting point for manipulation to create your own perfect cookie. Each ingredient of this recipe can be altered to change the final product based your own preferences. Let’s review each ingredient. If you want chewier cookies change out the all-purpose flour for bread flour. Bread flour has more protein and therefore will create more gluten. If you want cakier cookies increase the amount of flour to 2 1/2 cups. If you want thicker cookies with lots of texture cut back the flour to 2 cups and add 1 cup of oat flour. You can find this in the grocery store or create your own by grinding old fashioned oats in a blender to a fine crumb. If you want cakier cookies, add 1 tsp of baking powder and keep the 1 tsp of baking soda. If you want flatter cookies, eliminate the baking soda from the recipe. Salt is one of the ingredients that only affects the flavor. You can reduce or increase this amount according to your own preference for the salty/sweet combo. But don’t eliminate it completely! I usually increase it to 1 1/4 tsp and use Morton kosher salt for a more coarse flake. If you are wanting a nice chew to your cookies and have decided to opt for the bread flour, melt the butter. The water from the melted butter will mix with the flour to create more gluten. If you like a more complex caramel flavor to your cookies, brown the butter. If you want taller, cakey cookies, use shortening instead of butter or half shortening half butter. You can use butter flavored shortening if you want to keep the butter taste, but some people prefer the flavor of regular shortening. If you want a very soft cookie, replace all or some of the butter with shortening. The ratios of the white sugar to brown sugar are important to produce the kind of cookie you want. Higher white sugar to brown sugar ratios will produce a more crisp and crunchy cookie while higher brown sugar to white sugar ratios will produce a more soft and chewy cookie. Dark brown sugar will up the chewiness even more. Play around with it to produce the texture you want! Vanilla only affects the flavor of your chocolate chip cookies. Increase the amount up to 1 tbsp if you really like the flavor, or eliminate all together if you want a more buttery flavor. You can also use Mexican vanilla for a more unique flavor. It almost has hints of cinnamon. If you want a flatter cookie, eliminate 1 egg and cut back the flour to 2 cups. If you like a really crunchy cookie, add another egg white because it helps to dry out baked goods. If you prefer a moist and chewy cookie, eliminate one egg white and add 2 TBSP of milk. And now that you have your perfect cookie texture, add-ins are where you get to let your creativity go! Are you a milk chocolate or a dark chocolate person? Or maybe you even want white chocolate chips or a combo of different kinds! You could also add spices or zests or extracts. Or how about dried fruit or toasted coconut or nuts? There are literally endless possibilities! If you want a thicker cookie that doesn’t spread as much, bake them at a higher temperature (375F) for a shorter time and chill the dough prior to baking. This will allow the outside of the cookie to set before the butter and sugar melt and spread. If you want really flat cookies, bake at a lower temperature (325F) to allow the sugar and butter to melt before the cookie sets. If you want really soft cookies, pull them from the oven with the middles still look underdone. 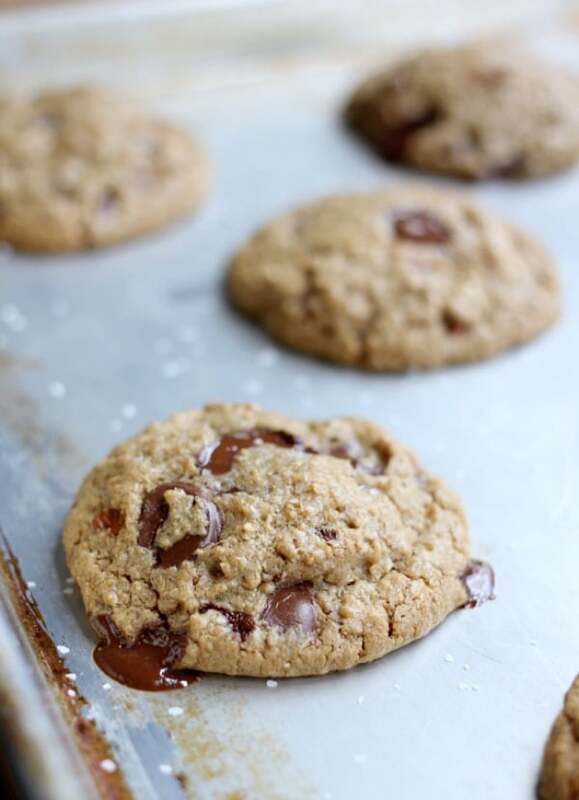 If you want really crispy cookies, allow them to cook longer until the cookie looks fully cooked through and allow them to cool completely on the baking sheet. 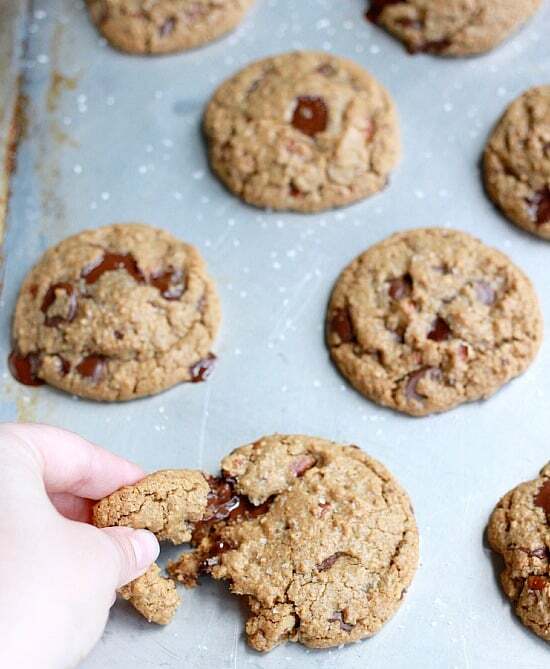 Use a cookie scoop for perfectly shaped cookies & add a few chips to the tops of each dough mound before going into the oven for that perfect chocolate chip cookie look. Larger cookies tend to bake more evenly. Make sure you are using the spoon and level method of measuring your flour so you don’t end up with too much in your cookie dough! Using the rules as stated above I have made various cookie recipes over the years with a variety of textures. Below you will find my recipe for Perfect Thin & Chewy Chocolate Chip Cookies. If you are looking for a different texture, check out one of my other cookie recipes or try creating your own! 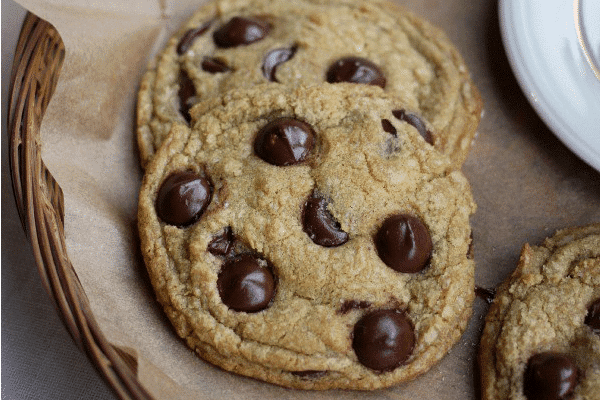 This recipe creates the perfect thin and chewy chocolate chip cookie. In a small bowl, whisk together the bread flour, baking soda, and salt in a medium bowl. Add the melted butter to the bowl of a stand mixer fitted with a paddle attachment. Beat the butter, granulated sugar, and dark brown sugar until combined. Add the egg, milk and the vanilla and beat on medium slow speed until incorporated. With the mixer on low speed, gradually add the dry ingredients into the wet ingredients until just incorporated. Scrape down the bowl as needed. 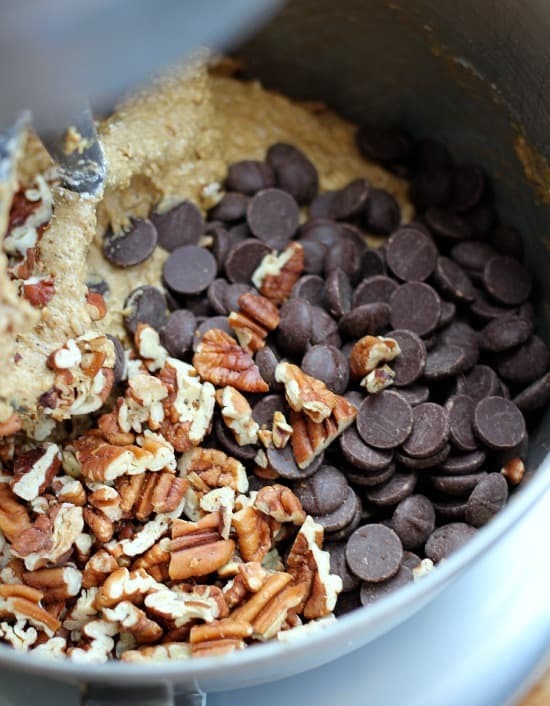 Add in the chocolate chips and mix until incorporated. Allow the dough to rest for 1 hour in the refrigerator. Preheat the oven to 350 degrees. Line baking sheets with foil or parchment paper. Using a large scoop, drop 6 dough balls onto each cookie sheet. Bake for 11-14 minutes at 350F, just until the edges are lightly browned. Slide the cookies on the foil or parchment off the cookies sheet as soon as they come out of the oven. Note: The cookies will be just slightly crunchy on the edges when cooled. If you want a completely chewy cookie and can resist eating them right away, store in an airtight container overnight and the cookies will be very chewy and soft in the morning. I follow the recipe exactly and my cookies still turn out cakey. In the past, I have mixed using a wooden spoon and then a hand mixer, which I know beats too quickly. But all produce the same result. Any suggestions on what I may be doing wrong? Hi Jessica! A few things could be happening. Can I ask how you measure your flour? Make sure you are lightly spooning into your measuring cups without packing it in at all. Then level it off. It is easy to accidentally pack too much flour into your cups. Also, do you buy chance have an oven thermometer to make sure your oven is heating at the proper temperature? If your oven is heating too hot, which this is a common problem with ovens, it will set the cookies before they have time to spread out. Hope that is helpful! I’m trying to make this right now because I’m craving cookies but the batter seems a little too runny for some reason?? I added a little bit of more flour which seems to have helped somewhat but I’m afraid it won’t be texture I want. Hi Marlena! Do you live somewhere that is very humid? That definitely could have affected it. If your batter is runny, definitely add a little more flour. It should be stiff like a cookie dough, not like a batter.